Bag-on-valve (B.O.V) technology is rapidly growing in packaging various pharmaceutical, personal care, home care products. Bag-on-valve technology provides an advantage for the aerosol products that require contact-free dispensing. Owing to the longer shelf-life, need of less or no preservatives, used with eco-friendly nitrogen or air, the bag-on-valve technology is being used on a large scale for cosmetics, food & beverages, and pharmaceutical packaging. Moving towards innovative and waste-reducing food packaging techniques. Major food companies are adopting bag-on-valve technology for packaging oil, sauces and other liquid and cream products. This is meeting consumer demand for convenience, easy-to-use and easy to store packaging. According to the Aluminum Association, recycling aluminum can save a lot of money and also reduce energy consumption. Hence, increasing number of manufacturers are producing bag-on-valve packaging using aluminum. Moreover, aluminum has high recycling value without loss of any quality. B.O.V technology also results in reduced amount of volatile organic compounds. Healthcare and other industries are also choosing sustainable packaging options. Hence, the bag-on-valve packaging is emerging as the most-preferred choice for manufacturers in various industries. 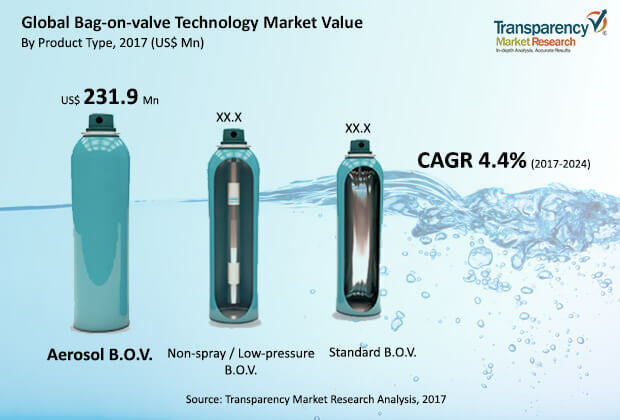 According to the report by Transparency Market Research, the global market for bag-on-valve technology is likely to see a moderate growth, registering 4.4% CAGR between 2017 and 2024. The global bag-on-valve technology market is also projected to bring in US$ 500.1 Million in terms of revenue. Compared to the standard and non-spray B.O.V products, aerosol B.O.V. product is expected to be largely preferred product throughout the forecast period. By the end of 2024, aerosol B.O.V. is estimated to surpass US$ 300 Million in terms of revenue. Increasing number of pharmaceutical companies are producing spray products using aerosol B.O.V. The bag-on-valve includes rolled-up multi-layered pouch attached to the aerosol valve. Also, aerosol B.O.V. functions equally at all the angles and also add convenience to the formulation by eliminating the need for preservatives. Qualities such as easy to hold, lightweight, unbreakable are driving the demand for aerosol B.O.V. Manufacturers are developing aerosol cans using aluminum on a large scale, due to its recyclable nature and low cost. Increasing number of cosmetic and personal care products including deodorants, lotions, creams, self-tanning sprays, and products for personal hygiene are using bag-on-valve technology. It eliminates the contact between propellant and product, it makes possible to dispense product in all positions. Manufacturers are also providing a sterilized bag-on-valve system to provide a sterile environment for cosmetic products, ensuring the safety of the product. Companies are also working on coming up with new methods of filling up the product in B.O.V. The bag-on-valve technology which was first originated in the cosmetic industry is moving towards the pharmaceutical industry. The rise in the production of spray, wound cleansing products, dermal creams, disinfectant sprays is resulting in the increasing use of bag-on-valve technology. Moreover, bag-on-valve is classified as a medical device in Europe. Hence, registering a bag-on-device as a medical device is considered to be the most cost-effective way to enter the market in Europe. The report by Transparency Market Research (TMR) offers an in-depth analysis of the global bag-on-valve technology market for the forecast period 2017-2024. The main objective of the report is to identify growth opportunities in the market. For this, the report provides updates and insights on key segments in the global market for bag-on-valve technology. Secondary research is conducted to calculate the size of the market. The report also offers segment-wise and region-wise analysis and forecast on the global bag-on-valve technology. The primary research was also conducted to provide qualitative data and also to arrive at an appropriate estimate on the global market for bag-on-valve technology. During the primary research, interviews with market experts were conducted. The opinions provided by the respondents were crosschecked with the valid data sources. The report includes the forecast on the revenue expected to be generated in the global market. The report also triangulates the data using various analysis on the basis of demand and supply in the market at a global level. Market dynamics plays an important role to help in identifying opportunities in the global bag-on-valve technology market. Both micro and macro-economic factors were taken into account to provide an overall view of the market. TMR report provides numbers in the terms of value and also evaluates the market based on the key parameters including year-on-year growth, CAGR, and volume. This helps manufacturers to identify the growth opportunities and performance of the global market for bag-on-valve technology. The report on the global bag-on-valve technology market provides value in terms of (US$ Mn) and volume in (Mn Units). Another important feature of the report is the analysis of the global market for bag-on-valve technology based on the segments and region. The report is segmented based on the product type, container type, valve type, application type, capacity type and region. The segments are further divided into sub-segments and region is further divided into countries. This helps in understanding market and provide a clear picture on the market growth. The report also provides data on an incremental opportunity. The incremental opportunity is the most crucial factor in identifying the level of opportunity for manufacturers and to get an idea on the potential resources in terms of sales in the global bag-on-valve technology market. To provide a clear picture on the growth and performance in the global market, the analysts have done a market attractiveness analysis to provide market attractiveness index. This helps in identifying current opportunities in the global market for bag-on-valve technology. The last and the most important section in the report is the key players currently active in the global bag-on-valve technology market. This section provides detailed profiles of the companies including a dashboard view. The report also includes details on the product portfolio, financial overview, and latest developments by all the key companies in the global market for bag-on-valve technology.